Ever since we brought home our Rockwood project, I’ve been scoping out all the Rockwood remodels I can find. I’ve got an awesome one to share this week. Manda and her family loved camping, but after a bad tent camping experience, they knew they had to find a new way to enjoy the great outdoors. Manda was tired of buying air mattresses and trying to make sleeping on the ground an enjoyable experience. 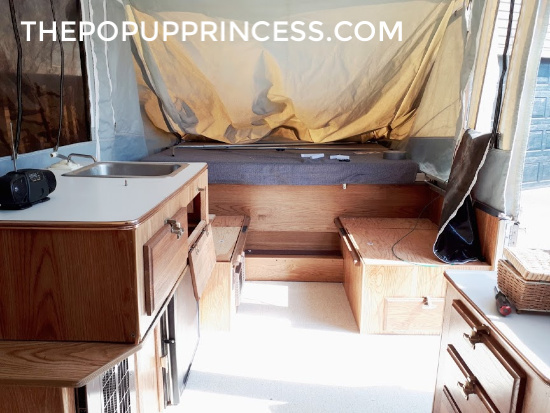 She and her family decided to buy a camper and were soon on the hunt for a pop up. They didn’t want to purchase a new tow vehicle, so they needed to find something small enough to pull with their SUV. It wasn’t long before she found her 1995 Rockwood on Kijiji. 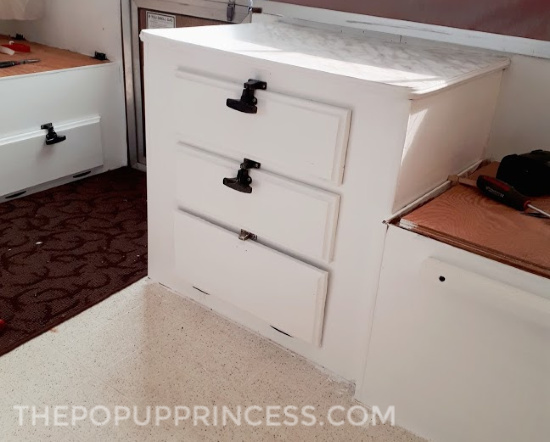 Manda brought her new camper home, popped it up, and from there, the adventures began. She started by removing the cupboards, curtains, and cushions. Then Manda gave her little PUP a good vacuuming and cleaning. With her camper all cleaned up, she had nice blank slate for her design. That made it easier come up with the theme and overall feel she was going for. 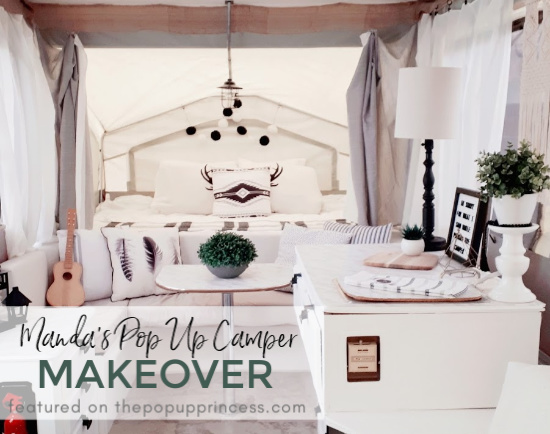 Manda wanted her camper to be light, bright and airy with touches of black here and there. She wanted white cabinets, so she selected a premier paint and primer in one specifically designed for kitchen and bath. It took two coats to cover properly, but the results were beautiful. Then Manda spray painted the hardware with Rustoleum paint in Carbon Mist. Manda used sheets that she purchased from Treasure Hunt to reupholster her cushions. 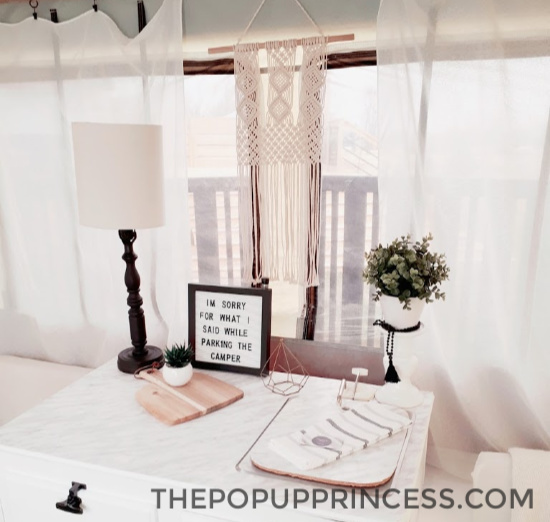 She isn’t much of a seamstress, so she cut the sheets to the size of each cushion, folded it like a gift, and pinned it in place. It worked, but eventually she plans to replace it with Velcro. The curtains for the bunks are actually tablecloths she cut in half. 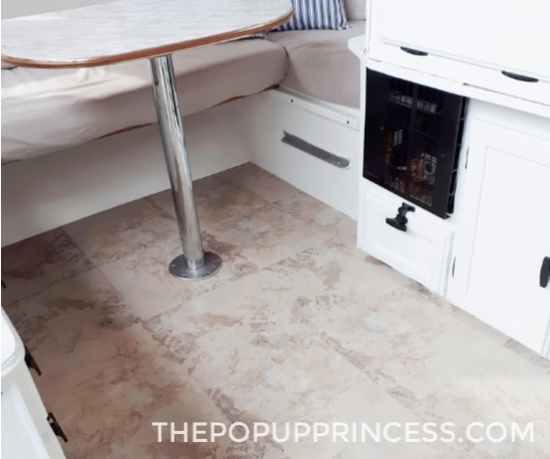 For the sheer curtains along the length of the camper, Manda used panels she already had and cut them to size. Then she strung twine along the ceiling and hung the panels from c-ring clips. 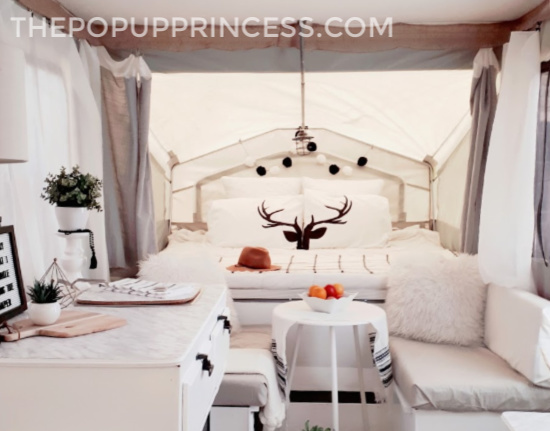 Manda loves burlap, so she used it all around the top of the camper in place of a valance. She simply stapled it up along the ceiling. 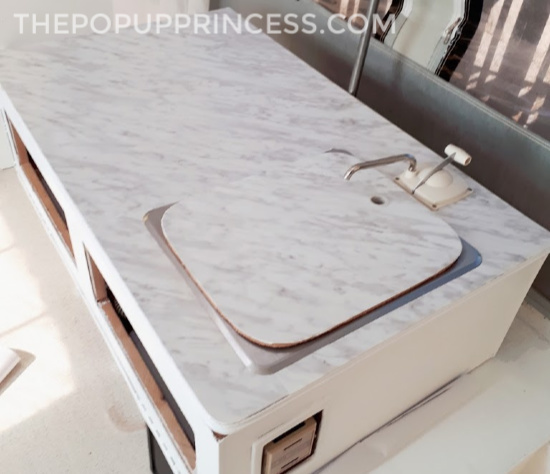 For the countertops and table, Manda used marble contact paper which she purchased from the dollar store. It’s durable and easy to clean, and she loves the way it looks. The last little job in Manda’s remodel project was the flooring. 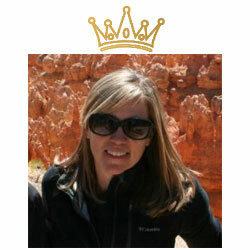 She selected a 12 x 12 adhesive vinyl tile in Sandstone from Home Depot. She said it wasn’t her first choice, but she really wanted to be finished with the remodel at this point. Instead of running all over town to find exactly the right tile, she just picked from what was in stock at her local store. The tile is thick, which made it hard to cut, but durable. Manda says it did a number on her hands, but it looks so good, it was worth it. The decor is Manda’s absolute favorite part. It’s boho meets rustic meets modern. 😆 It ties the whole camper together. She says it is going to be such a relaxing place to lay her head after a long day of fun and adventure. 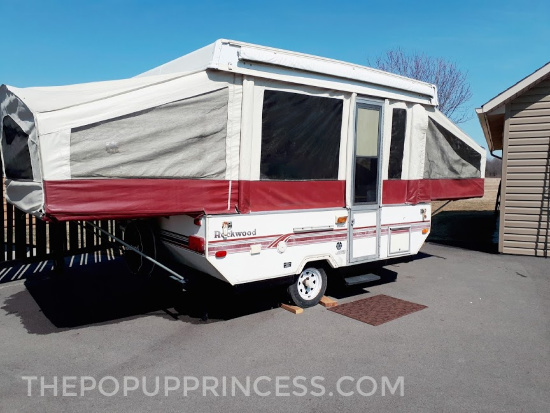 It’s still chilly the Niagara region, where Manda lives, so she and her family haven’t camped in their new little PUP yet. They are already making plans to take it out, though, and they might have to take a couple of extra people along with them. They have so many friends who have fallen in love with their “new” camper and want to come along on their adventures.